For cognitive therapy to be successful, therapists must identify the key factors that contribute to their clients' problems. Effective cognitive case conceptualization necessarily precedes appropriate targeting and intervention selection. It requires the integration of the results of a comprehensive assessment into a strong conceptual foundation. Solidly grounded in recent research, and focusing particular attention on important new theoretical developments, this book first offers a comprehensive overview of the contemporary cognitive model of therapy. It then lays out detailed, easy-to-follow procedures for assessing within a cognitive framework, developing effective individualized cognitive case conceptualizations, and implementing state-of-the-art interventions based on them. A step-by-step guide for concisely summarizing and representing the salient features of a client's presentation is included. Extensive case histories bring to life the entire process of cognitive therapy--assessment, conceptualization, and intervention--for several clients with a variety of complex clinical problems: panic disorder with agoraphobia, obsessive-compulsive disorder, and chronic or recurrent major depressive disorder. Cognitive Case Conceptualization will become an indispensable desk reference for many experienced clinicians as well as trainees. "…provides a concrete, step-by-step approach to cognitive therapy…Needleman has constructed an exposition of the cognitive model and its effective application in psychotherapy with a straightforward layout that intentionally mirrors one of the main tenets of the cognitive approach, illustrates concepts with numerous case examples, and provides detailed assessment and intervention strategies for clients experiencing panic, obsessive-compulsive, and major depressive disorders…it can serve as an excellent text for those teaching or learning the foundations of cognitive theory." 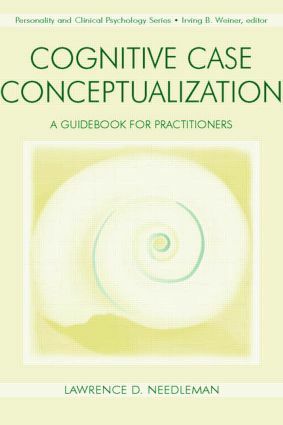 "Cognitive Case Conceptualization: A Guidebook for Practitioners is an excellent selection for the ready reference shelf of anyone who practices cognitive therapy. This book is brimming with up-to-date illustrations of cognitive therapy, and clear links to a rich and substantial empirical foundation. The process of cognitive therapy comes alive in Needleman's book, as realistic case examples, transcripts, figures, and discussions give readers a lucid view of what actually goes on within sessions and across the course of treatment. A real bonus is the generous appendix of blank forms which can be directly transported into the reader's own clinical practice, making these state-of-the-art methods immediately accessible." "The first principle of psychotherapy is that technique is only the handmaiden of hypothesis. The servant must not be allowed to become the master. In an emerging era of empirically-validated approaches to treatment in which an emphasis is placed on the technology of change, Dr. Needleman's book stands as an important contribution. It reaffirms the central importance of having a clear, coherent, and parsimonious conceptualization of the patient's difficulties to guide one's interventions. This is a well-organized, systematic, and highly practical book. It steps beyond earlier efforts in this area by addressing the importance of the patient-therapist relationship, modes of thought, and culturally-shared beliefs in the conceptualization process. It is a truly contemporary book and will be a useful companion to a range of cognitive and behavioral treatment manuals. No doubt this volume will prove valuable to both practicing clinicians and students of psychotherapy. Well done!" "Sound case conceptualization is an often neglected, but critically important foundation for all effective treatment. Dr. Needleman has done a superb job of presenting the elements of this process in a clear, comprehensive, and well written work. He guides the reader beyond the realm of the theoretical with detailed interventions and practical treatment strategies. This book is an excellent resource for clinicians and students of cognitive therapy. I strongly recommend it." "With Cognitive Case Conceptualization, Needleman has produced one of those rare books that will actually influence what clinicians do with patients! Many books on cognitive and behavioral therapies read like manuals, paying little attention to the individual client. This manuscript integrates wonderfully the 'what to do' with strategies to get to know the client. The result will be treatment plans based on good theory and science, and designed for the individual." Contents: Foreword. Introduction to Case Conceptualization. The Cognitive Model. The Therapeutic Relationship. Assessment and Information Integration. Cognitive Therapy Interventions. Panic Disorder (PD) With Agoraphobia. Obsessive-Compulsive Disorder (OCD). Chronic or Recurrent Major Depressive Disorder. Appendix: Blank Forms.